Fighting the No. 8-ranked featherweight in the world is always a tough challenge. To do it after more than 14 months away from the game proved to be a hill too steep to climb for Rony Jason in his Saturday bout with Dennis Bermudez, as “The Menace” delivered a three-round unanimous decision win at Vivint Smart Home Arena in Salt Lake City. Scores were 30-27 twice and 30-26 for Bermudez, who called for a fight against fellow east coast standout Frankie Edgar at Madison Square Garden in November. 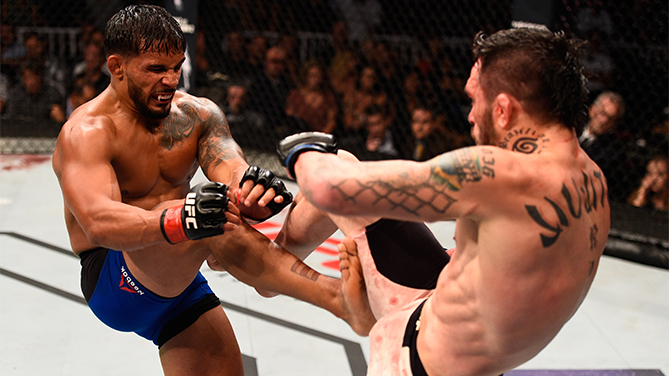 Bermudez got the fight to the mat in the second minute of the fight, and his ground-and-pound attack opened up Jason’s forehead, only prompting the New Yorker to keep dropping bombs from the top position for the rest of the one-sided frame. Jason scored with a hard right hand early in the second round, but the ensuing scramble saw Bermudez back in a dominant position on the ground. With a little over three minutes left, Jason worked his way upright and he got off some hard shots before getting grounded twice more. Jason got up both times, but he was fighting a losing battle on the scorecards, and Bermudez added yet another takedown just before the horn sounded. The former Ultimate&nbsp;Fighter Brazil winner had his best round in the third, with some solid striking, as well as effective ground work as he forced Bermudez into some dicey situations. “The Menace” fought his way out of them though, putting himself back into the top position as the bout concluded. With the win, Bermudez moves to 17-5; Jason falls to 15-6 with 1 NC. Middleweight contender Thales Leites snapped a two-fight losing streak in dominant fashion, submitting Chris Camozzi in the third round. Leites was in control from the start of the opening frame, spending much of it on Camozzi’s back as the two stood against the fence. And while Camozzi’s defense allowed him to stay out of a fight-ending submission, he did have some work to do if he was going to turn things around in the next two rounds. Getting the fight to the mat early in round two, Leites again took control and kept it through the entire five-minute period, but he wasn’t able to finish the Coloradan. A left-right by Camozzi got Leites’ attention as the final round started, but seconds later, the Brazilian had Camozzi back on the deck. 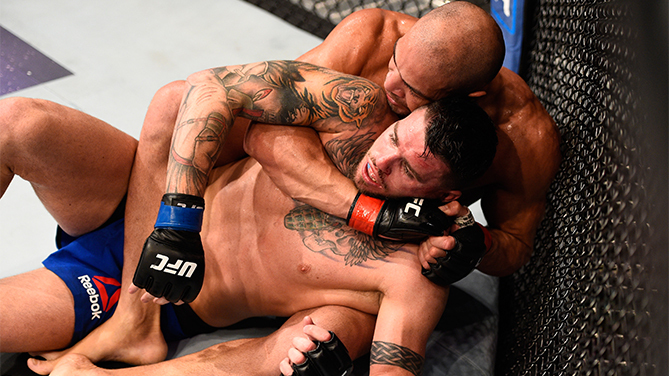 This time Leites wouldn’t let Camozzi off the hook, with a rear naked choke producing a tap out at 2:58 of the third. With the win, Leites improves to 26-6; Camozzi falls to 24-11. 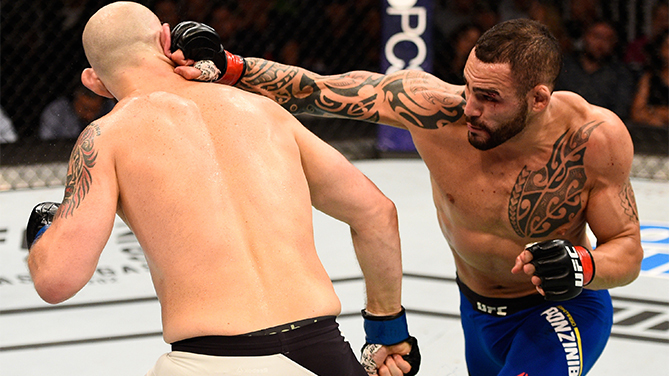 Welterweight up and comers Santiago Ponzinibbio and Zak Cummings laid it all on the line for three rounds as they looked to make a case for a spot in the top 15, and when it was over, it was Argentina’s Ponzinibbio picking up the three-round unanimous decision. Cummings (19-5) had a solid first round thanks to a striking attack highlighted by a stiff left hand, but it almost went for naught when Ponzinibbio (24-3) landed the best shot of the opening round, a right kick to the head with 1:40 left that allowed him to start breaking down his opponent and landing more significant blows. Both men were showing the wear of the battle on their faces in round two, and while Cummings again landed some good shots, it was Ponzinibbio starting to score with more frequency, his right hand being particularly effective. The third was a replay of the previous two, Cummings game and never out of the fight, but Ponzinibbio being one step ahead throughout, allowing him to take the fight by scores of 30-27 and 29-28 twice. Veteran middleweight Trevor Smith gave Joe Gigliotti a rude welcome to the Octagon, taking a lopsided unanimous decision win over the previously unbeaten newcomer. Scores were 30-26 across the board. Gigliotti had a rough start to his UFC career, as Smith smothered him against the fence for much of the opening three minutes. But after Smith received a pair of warnings from referee Dan Miragliotta for grabbing the fence, Gigliotti got to score some points offensively before getting locked up once more. Dropped by a knee from Smith as round two began, Gigliotti was in trouble early as “Hot Sauce” took his back. Gigliotti, now bleeding from the nose, got out of that immediate danger, but he still couldn’t get off the mat for the rest of the round. The third was just as rough for the Arizonan, as Smith dominated once more behind the strength of his ground attack, leaving Gigliotti no room to operate. With the win, Smith moves to 14-6; Gigliotti falls to 7-1. In the main card opener, No. 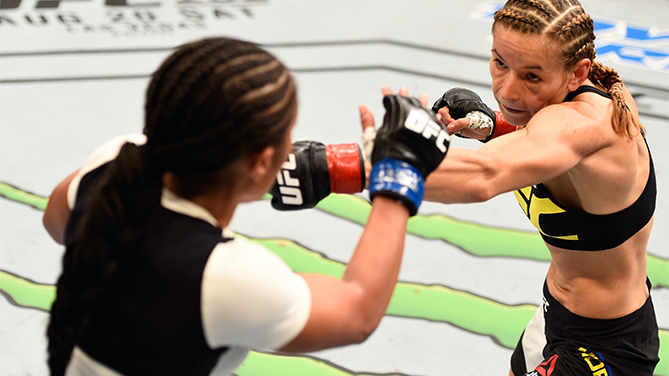 9-ranked strawweight contender Maryna Moroz won a three-round split decision over late replacement Danielle Taylor. Scores were 30-27, 29-28 and 28-29 for Moroz, now 7-1; Taylor falls to 7-2. Taylor, who replaced the injured Justine Kish on short notice, had difficulty figuring out how to make up the seven inches in height she was giving up to Moroz, and while she used movement and the occasional rush to try and make something happen, it was Moroz who kept the Californian at bay with a stiff jab and the occasional right hand. With a little over two minutes left in round two, Taylor cracked Moroz with a flush right hand that caused her legs to buckle. It was clearly the biggest punch of the fight to that point, but “Dynamite” was unable to capitalize on it, and the pattern established in the first round remained intact. 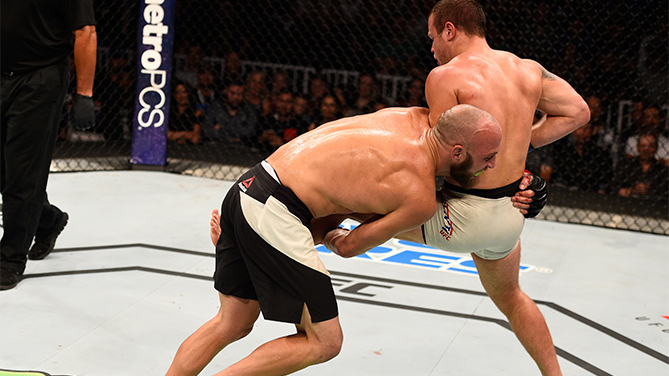 Moroz continued to control the fight in the final round, and while the crowd wasn’t pleased with the lack of action, the Ukrainian will take the victory.